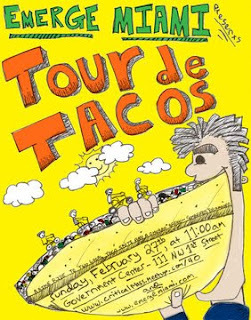 Do you enjoy bicycling, tacos, nachos and burritos? If so join Emerge Miami on their Tour de Taco ride. Bring your bicycle, a lock, an empty stomach, and some cash. The group will be stopping at T-Mex on South Beach, Churros Manolo in North Beach, Mercadito Taqueria in Midtown, and Lime Fresh in downtown Miami. La Lupita in Brickell would be a teriffic option.